Raise your hands if you don’t know at least one person who’s been diagnosed with breast cancer. Unfortunately, I’ll bet no hands went up. Mine certainly didn’t. But you can help in the fight against breast cancer by buying a gorgeous pair of shoes. Seriously. It’s simple. Just participate in the 19th Annual QVC Presents FFANY Shoes on Sale to benefit cancer research and education. Since 1995, the Fashion Footwear Association of New York (FFANY) with QVC has sold more than one million pairs of shoes and donated over $38 million to the cause. The sale takes place on Wednesday, October 24, 2012 from 5 to 8 pm Eastern Time, coinciding with National Breast Cancer Awareness month. If you miss the broadcast, don’t worry because through the month of October, you still can participate in the Shoe of the Day offered each weekday from 7 to 9 am Eastern Time, as well as shop online where you’ll find additional styles. You shouldn’t have trouble finding shoes to suit your style. You’ll have more than 90,000 pairs of shoes from over 80 brands from which to chose. Familiar names include, Nine West, Bandolino, AK Anne Klein, Carlos by Carlos Santana, Chinese Laundry, Guess, Kenneth Cole New York and MICHAEL by Michael Kors. But, wait, there’s more. (This is a QVC event, after all.) The shoes will be offered at half the manufacturer’s suggested retail price. 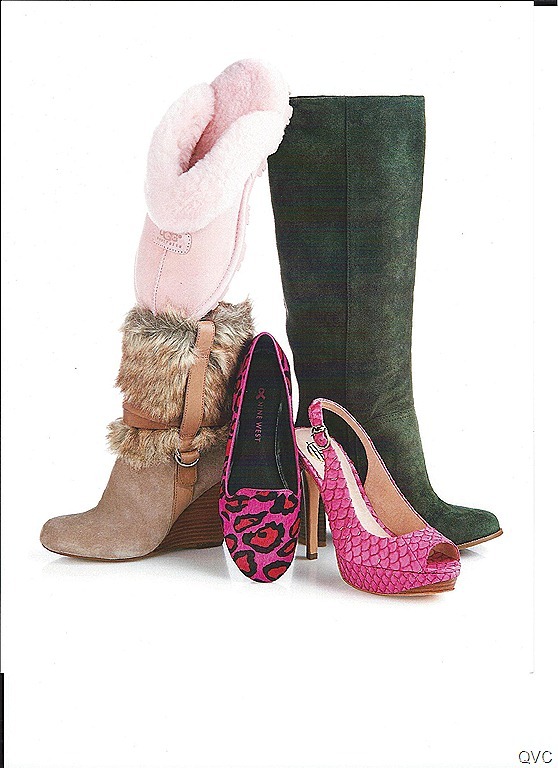 Fabulous shoes, fabulous prices and, best of all, the net proceeds benefit breast cancer research and education. How can you not buy two pairs? Or three, for that matter? I’m giving you this information nice and early so that you can stash some cash and hold off on hitting the shoe stores before then. You won’t have to wait long; October is right around the corner. Oh, and that means fall, and that means boots. I’m buying boots. I can’t have enough. You buy some, too. Then come back here and show me what you bought. Please share this terrific event with your friends on Facebook, Twitter, Pinterest, Linkedin — and even at the water cooler. It’s such a worthy cause. Thanks so much for reading! For the last 35yrs. I have been singing your praises as a chef ………hating that you don’t live next door anymore (I have had to LEARN TO COOK !! ), but did not know you were also so good about products, tips, and CHARITIES. Very proud of you. I will definetly order shoes (no gal — at any age — can have enough!. Thank you, Juanita! That’s so sweet of you to say. I know that you’re tops when it comes to charity events, having gone to many at your beautiful home in the past. Enjoy your shoes, and thanks so much for reading!